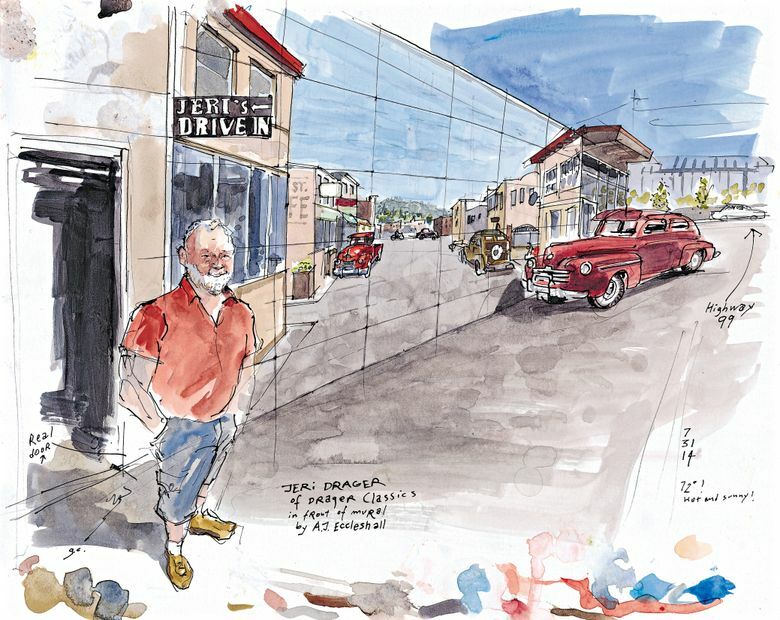 Jeri Drager’s collection of classic American cars off Highway 99 in Shoreline is a bright spot amid a bland landscape. He sells most of his cars at trade shows — Bruce Willis bought one in Idaho — and over the Internet, so few people visit his showroom or even know it’s here. But a new mural he recently commissioned is attracting more onlookers, including this sketcher. Painted by Edmonds muralist Andy Eccleshall, the artwork ties nicely into the history of Highway 99 as a commercial thoroughfare. Classic cars appear parked along businesses in a setting inspired by an old photo of Main Street in Edmonds in the 1930s. Some of those cars, including the 1947 Chevy Woodie and the 1953 Chevy pickup, are still in Drager’s collection, and you can see them for real if you step into the business. Drager himself also makes a cameo in the picture, riding a 1959 Harley Davidson. What makes the acrylic painting remarkable is the optical illusion of a road opening up in front of you. It’s an effect known as “trompe l’oeil,” (deceive the eye) and Eccleshall pulled it off so well that many classic car enthusiasts drive by to take photos of their cars in front of the mural.